Like many Aucklanders, leaving our city on a Friday night or especially over a long holiday weekend, I hate sitting in my car knowing traffic chaos is lingering a few slipstreams ahead. 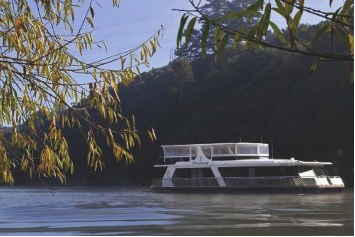 It’s unquestionably easier to take a stress-free Fullers Quickcat ferry ride across the gulf to soak up the engaging charm of Waiheke Island, or better still take your own vehicle over on a SeaLink Ferry from Halfmoon Bay in Howick. Places to stay are numerous. Island accommodation options are varied, especially if you want a weekend away from the kids or a romantic break with your partner, either way the island caters to all types of visitors: self catering, bed and breakfast, bach rental, cottages, motels, apartments, holiday homes, luxury lodges and retreats. On my recent three-night stay we ferried our own car over, it’s so much easier with luggage and transfers to be able to drive to your door. If you’re on foot, guest accommodation usually includes free transportation to/from the ferry. You can then buy a Fullers Explorer Pass to see more of the island or experience a scenic excursion on the island’s wine trail or arts & craft trail with Ananda Tours. On our visit we stayed on Onetangi Beach with self-contained facilities, even though we dined out twice for dinner and had lunch in a vineyard café one glorious day. ? ?Vineyards and grapevines as you can image, are everywhere on Waiheke as it’s now part of the iconic nature of the island. After checking into our accommodation, we negotiated a few of Waiheke’s narrow rural lanes past well-known winery’s; with 25 vineyards, Waiheke Island is by definition a wine connoisseur’s dream location.? ?The first thing you notice on a warm spring day is just how beautiful this island in the Hauraki Gulf can be. Each turn in the road presented another set of sloping vines, standing at attention like rows of army drill teams. Each row of vines glistened from the coating of rain that had just invaded this hidden realm, but minutes later the veil of gray clouds veered away to reveal a cobalt blue sky. One of our favourite stops for a glass of wine and local beer was at Wild on Waiheke, where hidden amongst the vines you can try archery, laser claybird shooting, as well as many other activities all suitable for families, corporate groups and visitors to the island. Paradise it can be said is never far away on Waiheke; listed by Frommers Travel Guides as one of the top 12 destinations in the world in 2009. 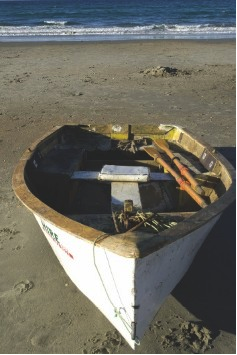 Put together a short ferry ride, sunshine, vineyards, good food, great beaches,?reasonably priced accommodation and attach it to a few days in Waiheke – you’ll be hard pressed to find a better combination for a long stress reducing weekend away. Sealink Ferries depart daily from Half moon Bay starting at 6am, $130 return for one car, $30 each extra adult, or family of 2 adults 3 children $81. There is one ferry service on a Friday from Downtown at 8pm and three sailings to Waiheke and three sailings from Waiheke on Saturday and Sunday. Their downtown wynyard wharf service on Friday, Saturday and Sunday starts up again on 28th September until may 2010. Convenient: pack the car and unpack at your accommodation. Enjoy a beer or wine on the boat in the fully licensed cafe. Super Gold card holders travel for free (driver and car must pay). Tel: 0800 732 546 . www.sealink.co.nz?? Oneroa: Oneroa Bay Villas, 136-138 Ocean View Road. Tel: 09 372 8422. Only minutes walk to the heart of Oneroa and Oneroa Beach. Cost: low Season 2 night stay incl. weekends $170 per night per couple, High Season 2 night stay incl. weekends $230 per night per couple. www.theweekender.co.nz?? Palm Beach: Palm Beach Lodge, 23 Tiri View Road. Tel: 09 372 7763. Enjoy spacious Mediterranean-style apartments with million dollar views over the Hauraki Gulf. Cost: From $210 to $280 incl. GST per two persons, per night, depending on season, and $80 per additional adult. These apartments are not suitable for young children. Whakanewha reserve: This is the only camping ground on waiheke Island but very popular in summer. For accommodation packages just one call Sealink and they will book everything. Headland Sculpture On the Gulf: A fantastic free journey of large scale contemporary sculptures as you walk waiheke Island’s magnificent 2 km coastal walkway. Adventure fishing Charters: Phil or Gailene, 19 Onetangi Road, Onetangi, price guide from $100 per person. Tel: 09 372 6023. 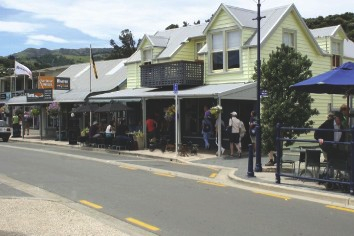 Oneroa village: A great place for banking, groceries, shopping, eating and drinking. Whakanewha reserve: Horse-riding and hiking trails in 270 hectares of bush and beach. Stony Batter: Self drive or take a tour to the historic WW2 gun placements. Sea kayaking: Ross Adventures. No experience required, two hire in sit-on-top kayaks is $25, 2 hour guided tours with sit-in kayak $55, 4 hour guided tours with sit-in kayak $75 Tel: 09 372 5550 www.kayakwaiheke.co.nz? With well over 30 restaurants, café’s, bars and takeaway outlets, Waiheke Island has a huge selection of dining options. Church Bay: Cable Bay Vineyards and Restaurant, 12 Nick Johnstone Drive. Tel: 09 372 5889. This is a superb lunch or dinner location with wonderful views back to the city. Oneroa: Vino Vino Restaurant, 3/153 Ocean View Road. Tel: 09 372 9888. Great spot in the heart of the village. open for lunch and dinner seven days. Ostend: Nourish café, 3 Belgium St. Tel: 09 372 3557. A worthy breakfast and lunch locale located in the heart of the island. Te Whau Peninsula: Te Whau Vineyard & Café. Tel: 09 372 7191. This is a great lunch spot with wonderful gulf views. Dinner is only on Saturday nights. Onetangi: Cats Tango, 21 The Strand. Tel: 09 372 2565.Perfectly located right across from the longest beach on the island.